Cisco's feeling the heat from multiple fronts in the data center and, conversely, other vendors are feeling the heat from Cisco. Cisco's revamped data center portfolio will go up against Juniper's recently unveiledQFabric line, Brocade's Brocade One products, Arista's 7000 series switches, Avaya's VENA architecture, Alcatel-Lucent's "Application Fluent" switches, platforms from Enterasys, Extreme and Force10, and server/storage/switching and virtualization architectures from HP, IBM and Dell. Cisco enhanced its Data Center Network Manager (DCNM) to now enable converged SAN, LAN, and server management for up to 150,000 ports. It also offers integration with VMware vCenter for provisioning, performance, and trouble-shooting. Most products will be available in the second quarter. The C260 M2 server will be available in the third quarter. The 5548UP and 5596UP switches are shipping at $750 per port. The ACE 30 module is shipping at a cost of $40,000. The director-class FCoE license on the Nexus 7000 costs $10,000. 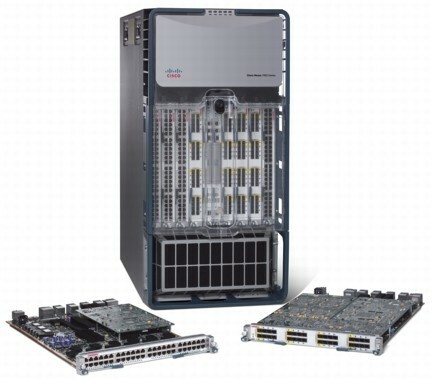 The data center interconnect line cards for the Catalyst 6500 cost $50,000 for a two-port 10G version and $95,000 for a four-port 10G configuration.